The Tribune carried a report today about how the broom business is booming on account of being the symbol of the APC. Several other papers have reported variants of this effect and we can at least agree that there isn’t much of a surprise here. However, there is something it can tell us about the kind of economy we are and the kind of economy we want to become. Let’s start with some basic economics. Please don’t be put off by the graphs. That’s a fairly simple supply curve (actually it’s a line in this case but let’s play along). 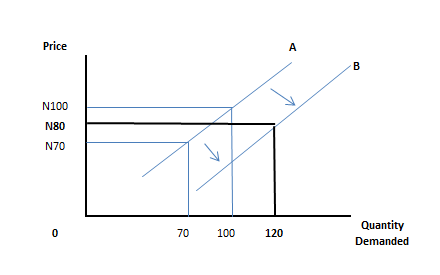 The graph illustrates one of the simplest points in economics – the higher the price of a product, the more suppliers will supply. Using the figures above, if the product in question sells for N70, only 70 units will be available for sale in the market. Why? Well, there’s obviously less profit to be made at a lower price so suppliers won’t be motivated to produce more for sale. But if the demand is actually more than 70 units, then you have more people demanding more than the amount of the product available. This will push up the prices and in turn, encourage suppliers to supply more of the product. Ergo, using the example above, the price goes back up to N100 and 100 units are once again available. 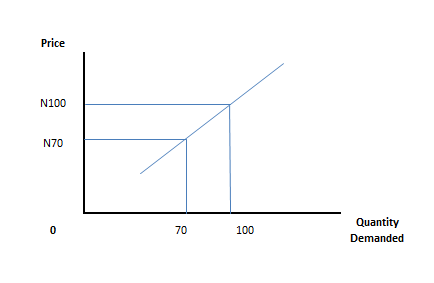 It’s tempting to take this supply curve as a full and simple explanation of what goes on in a market place. Indeed, it’s pretty much correct except that it is somewhat limiting as an explanation. One can conclude that an economy or a market just continues to dance along that supply curve – up and down – ad infinitum. Prices go up, suppliers are happy and supply more which means people can buy less thus reducing demand. So, prices go down, suppliers are unhappy and ‘go on strike’. This is what makes life better in an economy. More of the product is being supplied at a reduced price. Why? Because the supply curve has shifted, wholesale, outwards. In economic terms, this is the answer to the prayer of Jabez if you like – the area to the left of the supply curve is the coast of Jabez. His coast has been enlarged. When we were dancing up and down along the old supply curve, perhaps it would have been hard to believe that the market could clear 120 units of the product at N80. Looking at the old graph, to get to 120 units, we would have needed a price of N120. What gives? Profit has a smell and producers/entrepreneurs/suppliers have a nose for smelling it. The thing that causes that supply curve to shift outwards is the entry of new suppliers into the market. It’s not the old guys from the old curve who were leading us on the up and down dance. New hustlers have smelt profits and have entered. They are happy to sell for a lower price to win market share and as a result, they make the market bigger by drawing in people who would never have been able to afford the product or bothered to buy it (innovation or marketing). The world is full of practical examples of this. In 2011 in the UK, around 150billion text messages were sent. By last year, the number had dropped to an estimated 140billion text messages. If an alien were to land on Earth and the first thing he saw were those numbers, he might be tempted to conclude that humans are reducing the amount of time spent talking to each other. In reality, the supply curve for messaging has shifted outwards and new people who were not there even 5 years ago have entered the market. In this case, they haven’t even reduced the price; they have crashed it to zero. So today, the number of messages being sent via BBM, Whatsapp, Snapchat and the likes reached 300billion last year. People are still sending text messages. People are also sending instant messages. The sum total is that far more messages are being sent today than 3 or 4 years. The visiting alien would be spectacularly wrong in his conclusions. Mrs Hadija Ayeola a broom seller at Ojodu Local Government Area, told Inside Lagos that brooms within the period were sold between N150 and N250 each, depending on the size. “Right now, the price has turned back to the previous price of N80 and N100, but I must say that APC as a party has turned around broom business, not only in Lagos but also in other parts of the country. The business was good within the period of rally, I sold all my brooms and I thank God for the opportunity. We did not hike the price to the detriment of APC presidential rally in the state but we did it for us to have a livelihood. I travelled as far as Osun State to purchase the brooms and I have to think on what price to sell, so that I can make a little gain,’’ she said. Another seller, Mercy Odesola, explained that the business boomed at the period of rallies and also the commended APC rally in the state. “The price was not high; selling broom between N150 and N200 is not too much and you know that broom is the symbol of the party,’’ she said. Mrs Ayeola is not telling the whole story. Could she really have hiked the price of her brooms? It is doubtful. Mercy Odesola also makes reference to the prices in a way that tries to give herself the credit. Bless her. Definitely, more brooms are being sold. And people who were not broom buyers 6 months ago are now buying brooms. Knowing what Nigeria is like and how people don’t waste time in taking advantage of an opportunity, it is not hard to imagine that some of the people selling brooms today were doing something else a few months ago. We have new broom suppliers in the market. Another seller, Evelyn Njoku, also admitted the upsurge in demand for the brooms but regretted that the price had not changed. “Although the demand for the broom rose so high, the price still remained the same, a medium size broom still sells for N50.00 while the big one still goes for N100,” Ms. Njoku said. If you are looking for evidence that the supply curve has shifted out, this is it. Evelyn Njoku is saying that despite the increase in demand, she is unable to take advantage of the market by increasing her prices. Producers/Suppliers/Entrepreneurs have smelt the profits to be had from selling brooms and have entered the market. These days capitalism is like a dirty word. This is a tragedy because capitalism has done far more than anything else to better the lives of people around the world. Indeed, as one of my favourite Professors, Deirdre McCloskey, says, we should no longer call it capitalism (which gives the impression that capital is simply being accumulated) but ‘trade tested betterment’. 1. Imagine that the Nigerian government wanted to ‘support’ the ‘nascent’ broom industry. Since the government hardly has a direct relationship with many of its citizens, the first thing that will need to happen is for a cabal to be formed – Association of Nigerian Broom Makers and Distributors (ANBMD). The chairman of this cabal probably won’t know the difference between a broom and a rake, but what does that matter? The talent required to head this broom cabal is not knowledge of broom making but rent seeking. The cabal will pay courtesy calls to the President in Aso Rock where he will be handed a special broom and he will make a show of sweeping with it, live on television. The cabal will also present him with an award as Chief Sweeper of the Federation for his dedication to the local broom industry (which no other president before has shown). In the end, the government will come up with a grant of N5bn to support the broom industry or something of the sort. To crown it all, a massive tariff of 1,000% will be placed on imported brooms or, depending on how righteously indignant the Minister in charge is, an outright ban on broom importation. 5 years later, it will emerge that no actual brooms were produced but there was an uptick in the number of Range Rovers imported into the country around the time the grant was released. Meanwhile, brooms will continue to be smuggled in via Benin Republic to the shock, shock I tell you, of the Minister in charge. And yet, this example of brooms tells us a very simple point – the best way to help poor people is to buy things from them. It’s as simple as that. Mrs Ayeola, Mercy Odesola and Evelyn Njoku would probably never benefit from the N5bn ‘intervention fund’ for the broom industry. But the increased number of brooms they can sell is far better than any government fund. S-C-A-N-D-A-L: Nigeria spends N472.9 Quintillion Every Year Importing Slippers from Abroad! W-A-W-U! OMG! Slippers are of course something we can produce in Nigeria so by importing so many, we are keeping people abroad employed when we should be ‘self-sufficient’ in slippers. It’s a seductive argument and anyone who argues against it risks being labelled an economic saboteur or an agent of Western Economic Imperialists and racist marauders. But again, what does the broom example tell us? There are things which are already being produced in Nigeria that can be boosted. Look around you; they are all over the place. Of course it is sad that it has taken politics for us to discover that the broom industry not only has capacity to expand to meet rising demand but it can also do it very quickly and without fuss or government intervention. Nevertheless, the lesson remains useful – the economy has many more cylinders to fire on if the conditions are right. 3. Where you have a ‘nascent’ industry, well, it’s only natural that some ‘protection’ will be offered by policy makers. This is another ‘policy’ that is hard to argue against and some version of it is guaranteed no matter who is in government. But it’s worth thinking about a bit more. Of course, it always starts with protecting an industry against foreign competition but does it ever end there? From the point of view of those benefitting from the protection, foreign competition does just as much damage as local competition hence why cabals are needed to keep outsiders at bay. This kind of protection is what keeps a market dancing up and down on the same supply curve and makes it impossible for the supply curve to shift outwards. Imagine requiring a licence or approval to become a broom producer or seller? For sure, Evelyn Njoku wont be complaining about an inability to raise prices like she did above (assuming she’s inside the cabal). The increased demand would have been met by much higher prices and you get a scenario where people who need brooms to do their normal sweeping are priced out of the market and start resenting politics or anyone they feel is to blame. People talk a lot about money grabbing greedy capitalists yet in this instance, Evelyn Njoku’s ‘greed’ has been curtailed by the market – if she raises her prices, the new entrants will take her market share by under-pricing her. Once protection against foreign entrants starts, it is only a matter of time before Nigerians become the actual victims. No market better illustrates this than the cement market in Nigeria. 4. Final point – where can broom making elevate a nation to anyway? It’s hard to tell. 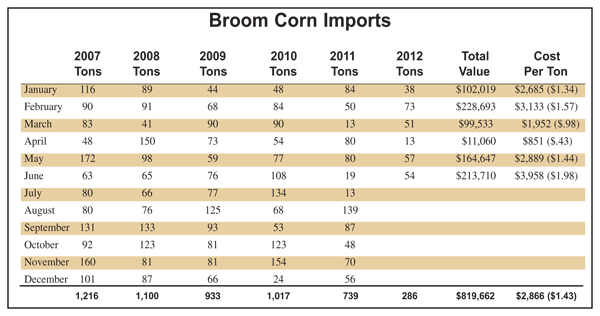 But in the first half of 2012 alone, Mexico exported 3.1million brooms (broom corn) to the United States (see chart below). The Mexican broom industry got a big lift when the North American Free Trade Act (NAFTA) was passed in 1994. The American broom industry couldn’t compete and most producers left the market for the Mexicans. The point here is that brooms are hardly the first thing you will think about when trying to figure out what a country can export. But homes and public places will always need to be cleaned and presumably, witches will always need to fly. That the demand or exportability of something is not immediately obvious doesn’t mean it does not exist. All of this leaves us with one final question – how can we boost demand in a way that is not artificial or overly cyclical like what we have in the ongoing political economy? How can we get Mrs Ayeola to sell more brooms, whether or not the APC have it as their party symbol? We know that she will put the money back in the economy by using it to send her kids to school and buying better quality food etc. Good insight. We just need APC to hold rallies every other month to sustain this peak demand, thereby creating a robust market and encouraging more market participants and boom, a significant dent in the unemployment numbers. I just hope in so doing (rallies), it won’t be government funds that are used to sustain the industry. Annoyingly the average broom lasts about 18-24 months depending on use, these rallies will only create a glut in the market as brooms have no alternative use. Poor Mrs Ayeola. Hopefully the APC government will boost infrastructure development and build more houses, and tweak the land use act to encourage more private buildings and boom, Mrs Ayeola is back in the green. But I bet you that the Association of Vacuum Cleaners Manufacturers of Nigeria (AVCMN) aren’t going to take this broom boom lying down. Interesting read. We should all become economists! Now this is most impressive. Beautiful analysis. I look forward to subsequent pieces; I should become an Economist soon, no thanks to you! But isn’t any line merely a special case of a curve with the unique characteristic of having a constant slope? Geeky considerations aside, that was a good read as usual. Light but insightful. Well done.